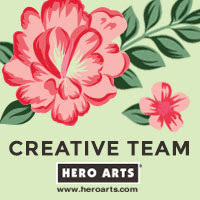 Hello there, today we are celebrating the launch of the August 2018 My Monthly Hero Kit from Hero Arts. The theme of the main kit, as well as the optional add-ons, is coffee and tea. I know a lot of you love coffee and tea, so this kit is for you! If you are following on from the hop, you should have arrived here from the amazing Lydia but if you get lost along the way, the full list of participants is below. My card today uses the window fancy die from the main kit. As soon as I saw this die, I fell in love with it. 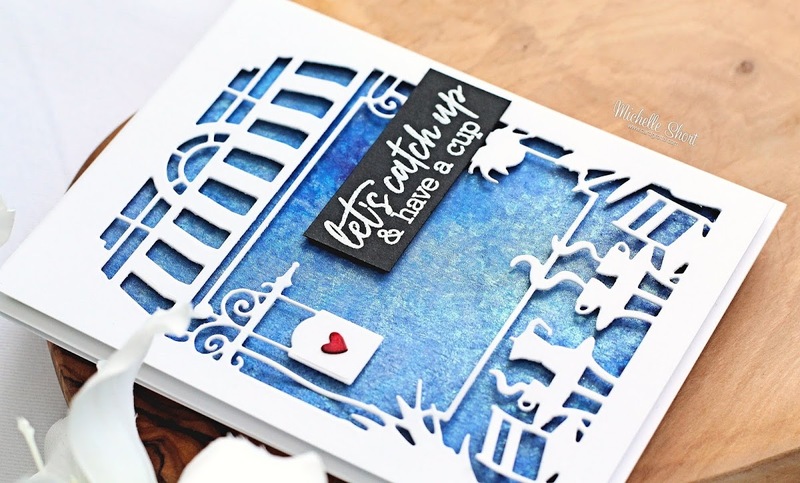 I love these type of dies and the possibility they have with them - you can create a silhouette look, you can colour them to be the scene itself, I just really like them. I started off by cutting the frame from a panel of white cardstock. I then went ahead and created the background. I used a combination of different blue sprays, as well as the Hero Arts Iridescent White and a sparkle spray to give it lots of shine. I thought it kind of looked like you were looking out of the café window on to a sparkly sky. The background panel was added flat to an A2 white card base with tape runner. I then added the window piece on top with foam tape. I took the sentiment from the Spill The Tea set (which is an optional add-on this month) and heat embossed that on to black cardstock. This was cut out and added to the card with more foam tape. To finish off, I die cut a little heart from white cardstock (using the Sun Showers dies) and coloured it using red Copic Markers. I added this to the sign and then coated it with the Crystal Clear Lacquer Pen that you get in the kit. 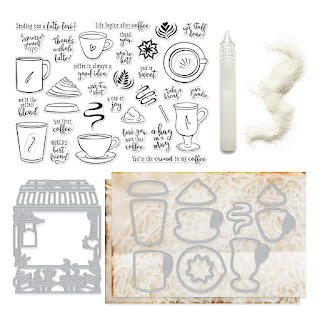 The August 2018 My Monthly Hero Kit contains a 6" x 8" clear stamp set, 1 Window Fancy Die, 11 coordinating Frame Cuts, Crystal Clear Lacquer Pen, White Puff Embossing Powder and two sheets of coffee and tea hand dyed decorative paper. All of this is worth $77 but you can get it for an amazing $34.99 (approximately £28 depending on exchange rate). 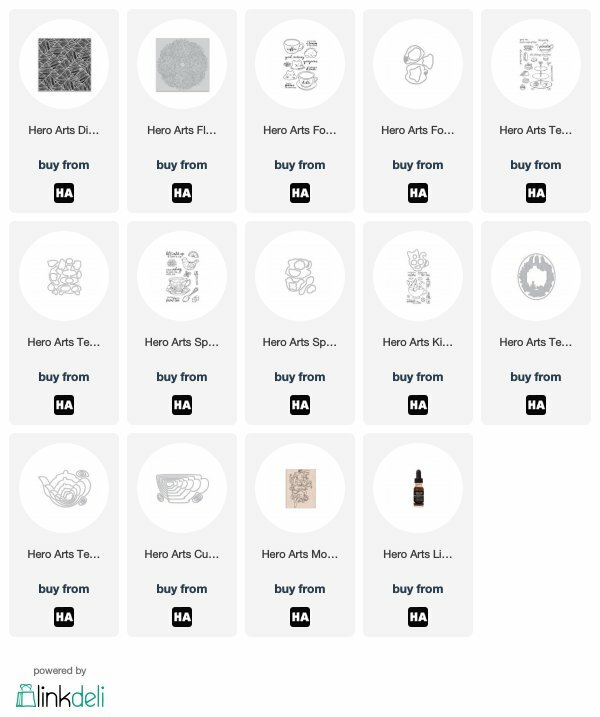 Hero Arts are giving away one kit to one lucky blog hop reader - selected from all the comments left across all the stops in the hop. The more you comment, the more chance there is to win! One comment per blog. The giveaway closes Sunday, August 12th at 11.59pm EST. The winner will be announced the following week on the Hero Arts blog. Good luck! Next on the hop is the amazing Nichol. Thanks so much for stopping by to see me today. I hope you have a great time on the rest of the hop! 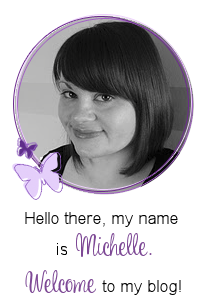 Hi, Michelle; thanks for sharing! Lovely card. I love that sentiment. I really love the cafe die. And i love that you show we can keep it simple and still have a really elegant and quaint card! Bravo! Oh I just love this kit, I swore I would stop buying, already have way too much, but I can’t help myself. Beautiful background - inspired me to use Brushos - will have to wait until my kit arrives. TFS! I love, love, love this awesome new die. Your card is fabulous! LOVE the Fancy Window die in the new kit...your card is gorgeous. The beautiful, blue background really sets off the white die cut. Thanks for the inspiration. Beautiful card. Thanks for sharing. This is an amazing kit this month. Lovely & beautiful cars! The kit is a great value! this kit is so fun. lots of ideas. i like the doily background stamp. you can mask it onto the cups too. great cards. tfs. Beautiful card! Love the blue color. Beautiful card. I love that die, and your background is gorgeous. What a great blue background! I love your card! So delicate! What a sweet little scene. I love this die! Your card is gorgeous! Clean and simple with that pop of color to make it truly stand out! Love it! 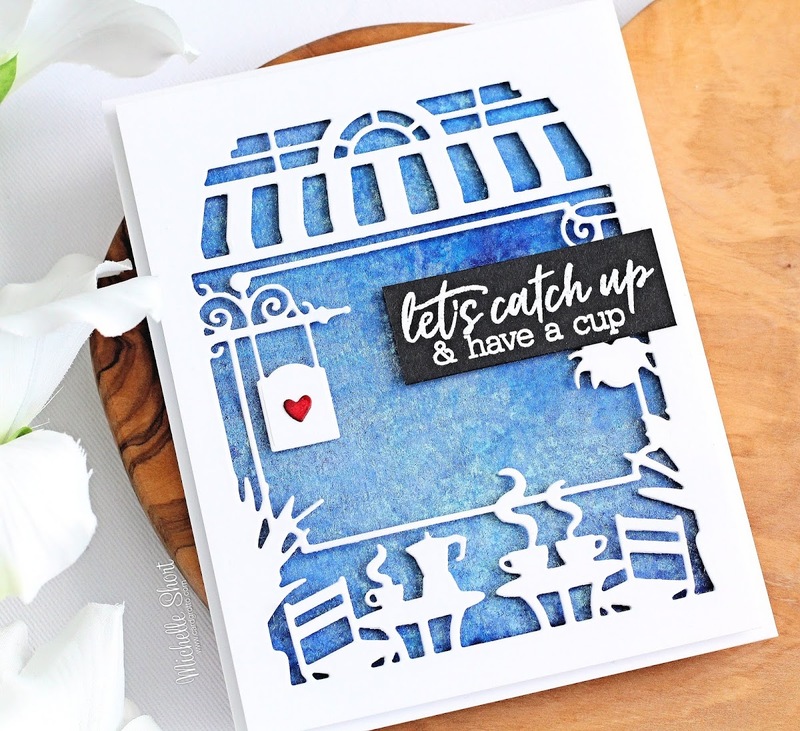 Of all the cards on the blog hop, your card is by far my favorite use of the tea party die! Seriously. It’s freakin adorable! Great looking card. Have to love that die that just sets the scene perfectly. Beautiful colors for your background of this card! I am so loving the little red heart that you have on the sign! It is just so precious!! I can't believe no comments - that's a wonderful card! I like how you added the heart and it's a great kit from HA! I love your clean card and a more simple background. Thank you for the inspiration. Love the amazing card. Looks like you can look right through the window. So simple and beautiful. The crisp look of blue and white is only enhanced by that tiny sweet red heart. Just love it! Great card and sneaks and such a great new kit! Thanks for sharing with us on this fun blog hop!! Such a simple, beautiful card. Thank you for the inspiration! I love the cafe die!! Love your project! Can't wait to get my kit! Hmmmmm, now what can I add on? Michelle, this is wonderful! I love the pop from the heart....oh so SWEET. This is simply beautiful, I love the background coloring! Like the wonderful colored background with the crisp white die. The cafe die is so elegant and classy. Love the red heart on the sign. Love this kit! Love your card! The ink blending in the background is perfect! 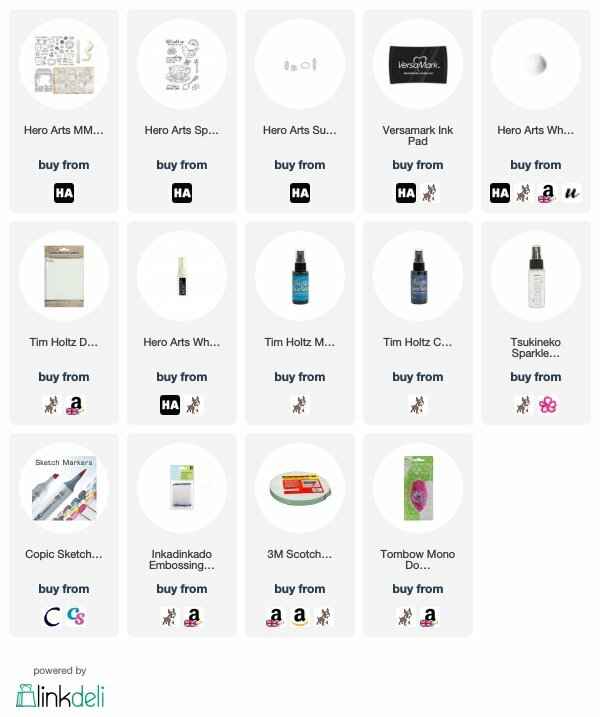 Awesome August Kit I love your project! Awesome cafe scene! The die with the scene is fantastic. I love simple designs that result in a wow effect; this card design is perfect! Thanks for sharing. Lovely cards. And this kit is so amazing! Your work is beautiful. This is such a great die... I love everything you do! Such a lovely card, thanks for sharing. I agree, I can’t wait to use the fancy die. It’s very unique. I love the blue behind it with the little pop of red. Cute, simple card in which the receiver will be thrilled to receive. Such a lovely card! Love the design.. Very pretty card. Love the white with blue background. I live the cafe scene, what a beautiful and simple card. The die cut with the blue background is simply stunning. Love it! Love it! The cafe silhouette die is a new fave!!! 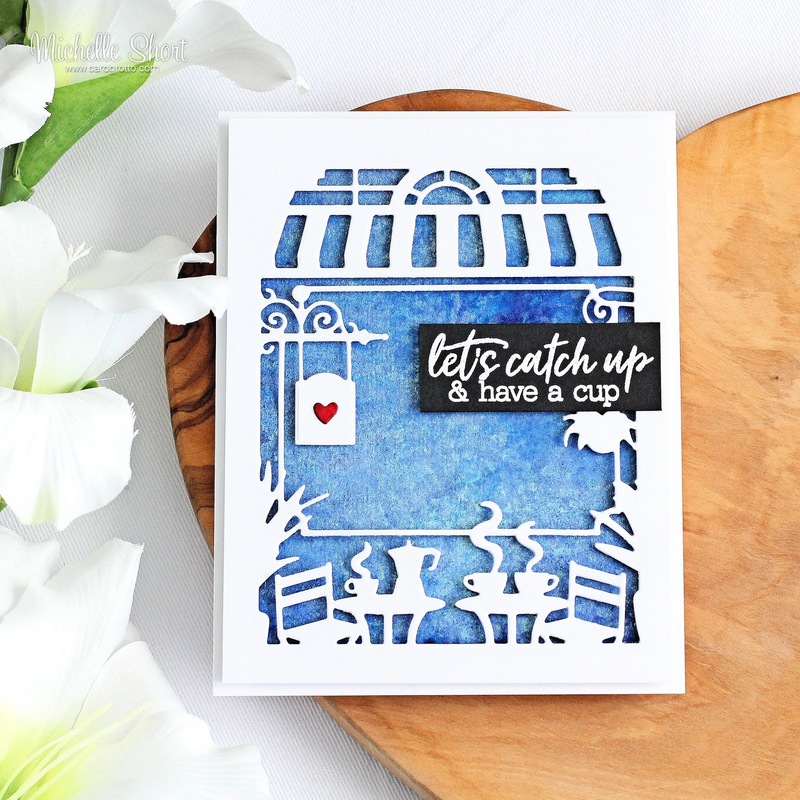 The romantic blue background that makes the special die cut just POP!! 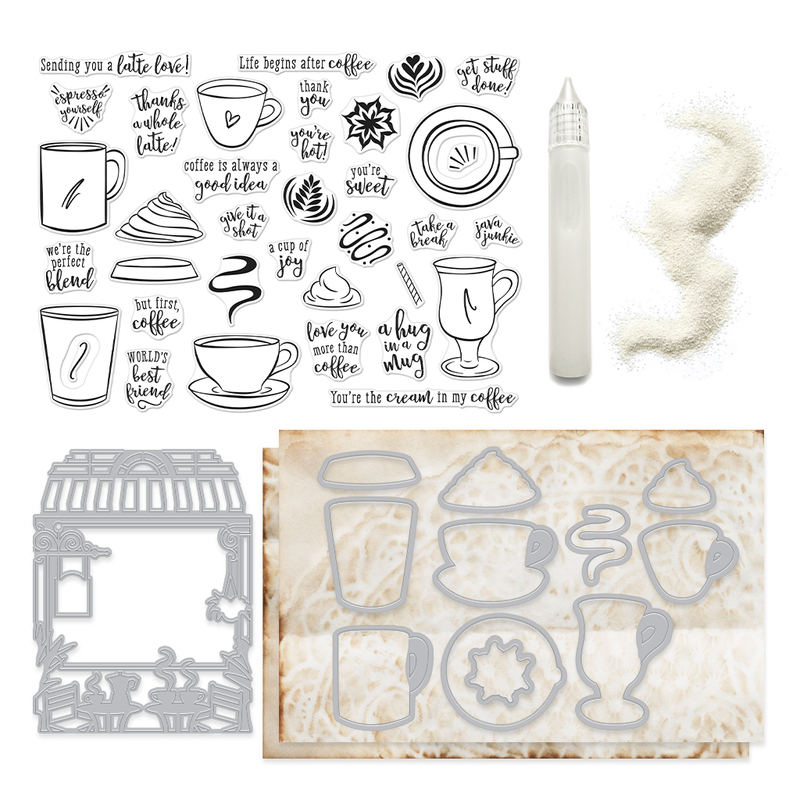 I absolutely LOVE this bistro scene die...my favorite item from the kit!! I love the diecut card and that Mermaid Lagoon color is to die for. Thank you for sharing. Gorgeous card! Love the way you've used the products! Great card and I love the colors, the heart and the die cut. thanks for sharing. What a lovely card. I like the idea that you’re sitting in the cafe looking out at a sparkly bright day. Thanks for sharing. Awesome card Michelle, I love this months kit and this die is to die for! I love that frame die. Simple yet amazing card! I love seeing the big die in white! It looks so neat with the background. Great job! The blue background really works well here, and your tea time card has such a delicate appearance. I love them both! This is so cute. At first I hadn't noticed the scene die. I love it. Can't wait until it arrives. Love this die and the background. Such a lovely card! Beautiful colors and design. That's exactly the background I would have done with this card too! This is a super new kit and I love your creation! This die is amazing - possibilities are endless! I just LOVE that cafe die and your background makes the scene even prettier! I absolutely love your sweet card, Michelle! The blue background with that little red heart is just perfection. Fun card, fun colors. I am enjoying all of the different uses for both the stamps, AND the background die. Thanks for sharing. That cafe die is such a good one and what you did with it looks very nice! Such a pretty background.